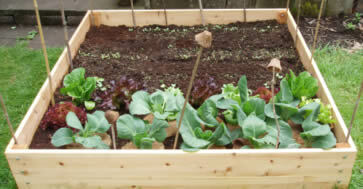 Raised Beds - don’tcha just love ‘em ...... ! .......Well - why do you love them I hear you say ? But I’m sure you have your own ideas ! 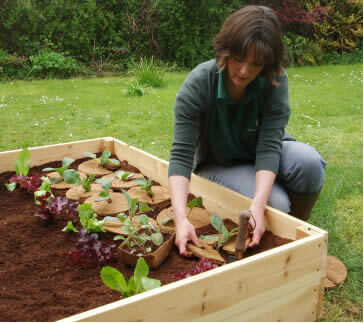 Using a wooden raised bed you can quickly put a garden right where you want it, veggies and herbs next to the kitchen for example. You can really put in just the right mix of soil, compost and all the other goodies just perfect for whatever you want to grow. Getting technical, it’s so much easier keeping the pH right in a small area. 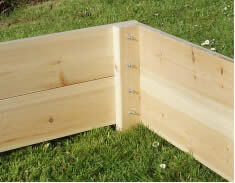 Plus you know exactly what is in your raised bed, you can have an instantly organic area ! 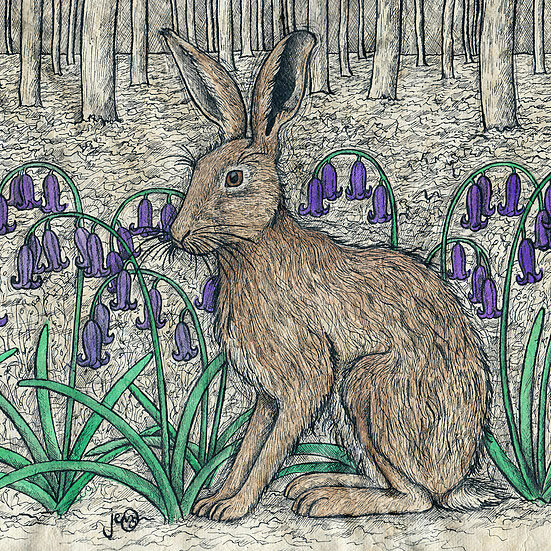 They are ever so easy to weed, and you do not have to go trampling all over the soil. It’s this soil “compaction” which stops air and water circulating - and the roots stretching their toes ! 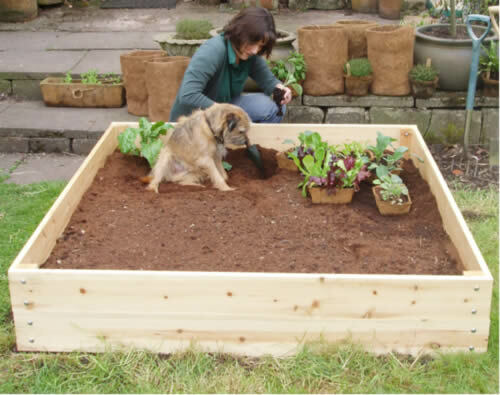 You can put raised beds in places you would normally avoid, or would have to grow specialist stuff - boggy, rocky or very sandy soil. 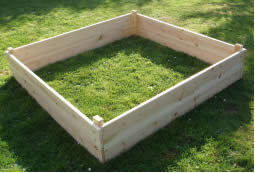 Lastly, a raised bed can immediately brighten up a really dull spot ( or cover up uncut grass !) they just look so nice, even in the smallest garden ! These two pictures were taken 16 days apart. I’m planting David and Sheila’s Veg. Plants in one half, and sowing a whole range of seeds in the other. I have decided, though, that I’m going to put in another raised bed with some veggies that both taste and look really nice. Oh, I’m getting really carried away now. You can see I have used Mulch Mats around the plants. These really really to put off the slugs and snails. The pigeons and sparrows ( boy do they love Chard ! ) don’t seem terribly worried when I throw the mats at them though- am still working on that one ! String is so fiddly - any ideas ? I’m only 5’ 1 and ¾”, but do not like fiddly little raised beds. These are 5’ square and about 1’ high, but I can easily reach all over them. Also, you may have noticed but I’m not really into heavy unnecessary work - your thinking of that lawn again - so with all of my raised beds ( I have some smaller ones, you can see them on the larger biodegradable plugs page) all I did was lay several layers of newspaper underneath the bed. It takes some time to compost down, and have never had any trouble with weeds coming through. If you want to grow potatoes though, you will need to dig a bit first - or cheat like me by using larger biodegradable pots, they are doing a good job covering my scruffy old patio now ! 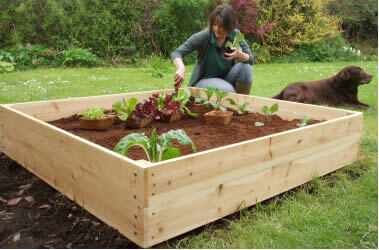 Our wooden raised beds are made for us by the team at Widemarsh. As always we use FSC approved timber, and preserved with environmentally approved treatment to last a good 10 years. They can be used either way up. On a flat, hard surface use the bed with the corner posts pointed upwards. Providing the drainage can be sorted out you can use these beds anywhere flat. Any scruffy old concrete or paving about ? 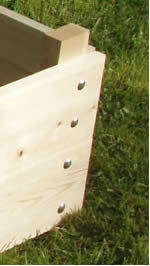 You can see here the 4 stainless bolts at each corner, putting these in is all you have to do. If you have not got a spanner, I’ll send you one ! They literally take about half an hour to bolt together, the one above took me 20 minutes. Here I have put my new raised bed nearly against the old patio, but have pulled up an old flower bed. My cunning plan is to plant Rhubarb here. The longest part is filling it up. For soft ground use the ‘flat’ side up. But sorry, transport on this ‘ Ready Made Bed’ is £19. But if just one more person tells me the lawn needs cutting !